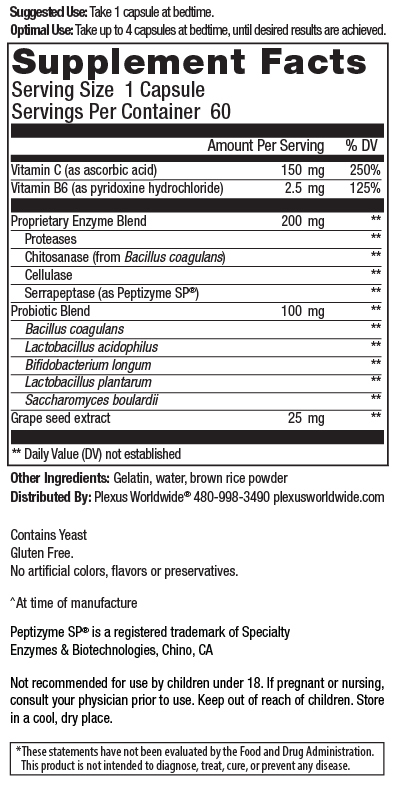 Who should use Plexus ProBio 5 ? Compatibility with Plexus Products All Plexus Products. TriPlex Combo especially recommended. Recommended Servings Per Day Take 1-2 capsules on an empty stomach. Up to 4 capsules can be taken daily. How can Ambassadors provide even more detailed information & advice on the product? Ambassadors can access the Product Information Sheet in Virtual office. Can children under the age of 18 use ProBio 5? Plexus ProBio 5 is not recommended for use by children under 18 because the product was formulated to meet the nutritional needs of adults. When should I take ProBio 5? A great time to take ProBio 5 is right before bed. Does the CFU amount in ProBio 5 remain the same through the expiration date? Yes. Plexus labels the product to meet the shelf-life dating. Can I take both VitalBiome and ProBio 5? Can I take ProBio 5 with TriPlex? Yes, ProBio 5 is a perfect companion for TriPlex. We suggest taking VitalBiome in the morning and ProBio 5 at night. Bio Cleanse and Slim can be taken as usual. How many servings of ProBio 5 can be taken daily? Up to 4 servings of ProBio 5 can be taken daily. Where can I find the lot number and expiration date? The lot number is a 6 digit number found on the bottom of the ProBio 5 bottle along with the expiration date of the product. What are the enzymes in ProBio 5? Our enzyme blend consists of: Proteases, Chitosanase (from Bacillus coagulans), Cellulase, and Serrapeptase (as Peptizyme SP®). What are the probiotics in ProBio 5? The 5 probiotics are: Lactobacillus acidophilus, Bifidobacterium longum, Lactobacillus plantarum, Bacillus coagulans, and Saccharomyces boulardii. What is chitosanase in ProBio 5? Is Plexus ProBio 5 safe? Yes, ProBio 5 is safe. Plexus meets or exceeds all regulatory standards and guidelines for product safety and efficacy. Is it okay to use a Plexus product beyond the expiration date? Plexus recommends the products be used within the expiration date for best efficacy and flavor. Although products can be safely consumed past the expiration date, it’s possible the flavor and amount of vitamins, minerals, and nutrients may diminish over time.